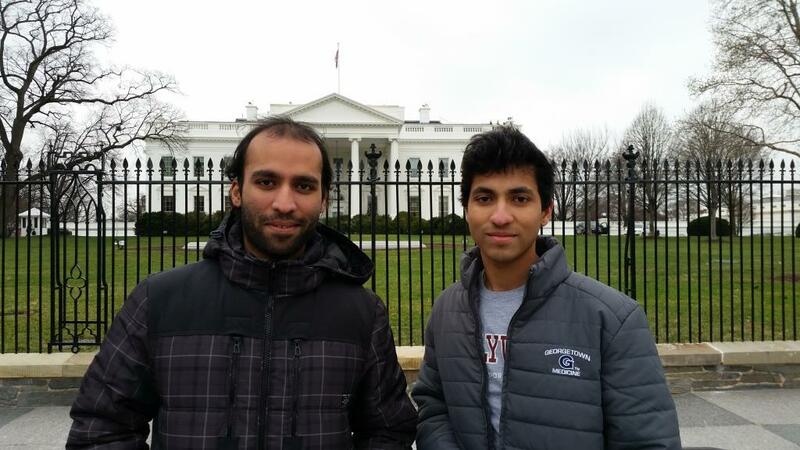 Craig Miranda, right, spent his winter break visiting his brother Clive, who lives in Washington, D.C.
Editor’s note: Far from Home is an occasional series in which we document a year in the life of international students at Penn State Erie, The Behrend College. As Craig Miranda made his way up the steps of the Lincoln Memorial, he could not help but stop to revel in the moment. The brisk air and tenacious winds that day were unlike anything the Kuwait native had experienced so far in the United States, but they did not deter his concentration from the history he was just then experiencing. Miranda’s epiphany atop the Lincoln Memorial was one of the many memories he made during a visit to Washington, D.C., this winter break. Rather than return home, Miranda opted to spend the holidays with his brother, Clive Miranda, who is currently pursuing a master’s degree in physiology from Georgetown University. For more than 20 days, the two spent time touring the city’s monuments and sights. From the White House to the Washington Monument, every base was covered. For Miranda, whose exposure to the United States was previously limited to Erie, the trip was an eye-opener. Protesters were everywhere. Public transportation was a new concept. And he had never done so much walking in his life. “It really helped me compare and contrast Erie to other places that I have not yet seen,” he said. For all of the trip’s unfamiliarities, one constant remained. Miranda’s visit with his brother was also special because this marked the first time he spent Christmas and New Year’s Day away from his family in Kuwait. He says he missed home, but spending the holidays with his brother was the next-best thing. Miranda even surprised Clive with a special — and appropriate — Christmas gift: a Penn State jersey. The way that Clive expressed his gratitude might have been the best gift of all, though. 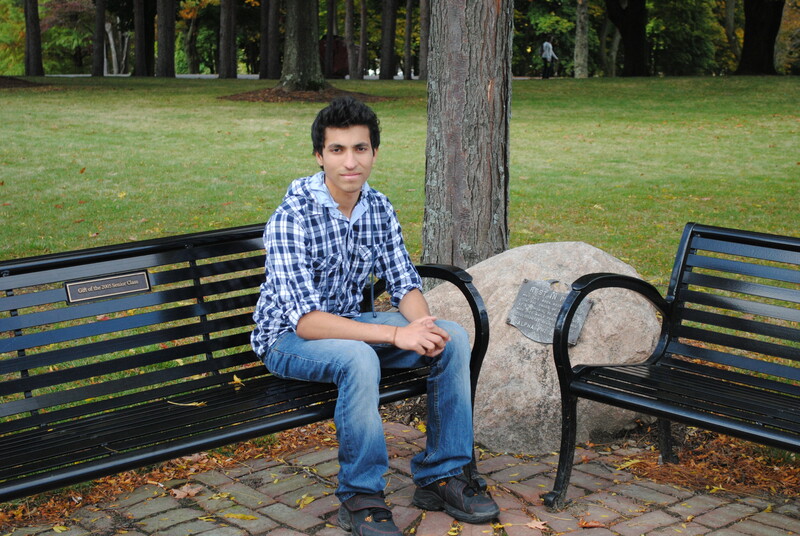 Craig Miranda has experienced plenty of things during his first semester in America. He’s seen snow for the first time, traveled to New York City and even started his own musical performing club at Penn State Behrend. Last week, the first-year computer science major experienced something new: the dreaded all-nighter. For Miranda, it was not exactly a bad thing though. Miranda has not been pulling the all-nighters in vain. This week marks finals week at the college, and he has high expectations. Thankfully, Miranda has had plenty of help when it comes to staying motivated. In Niagara Hall, he and his friends get together to study each night. These study sessions usually go until 4 a.m., but that doesn’t mean they don’t sprinkle some fun into each session. “We’ve been taking over the study room each night. Then at 2 a.m., just for a half hour, we will blast music. The music pumps us all up, so then we’re ready to study again,” he says. With all of the late-night study sessions, Miranda estimates that he is now averaging just over four hours of sleep per night. That’s OK because he says that’s all he needs. After all, he already has the perfect recovery plan. “I can hibernate during winter break,” he says with a smile. Miranda’s last final exam for the fall semester will be this Friday, Dec. 19. He will leave on Saturday for Washington D.C. where he will spend the winter break with his brother, Clive, who is pursuing a master’s degree at Georgetown University. Before he leaves though, he already has a personal celebration planned in honor of completing his first round of final exams. 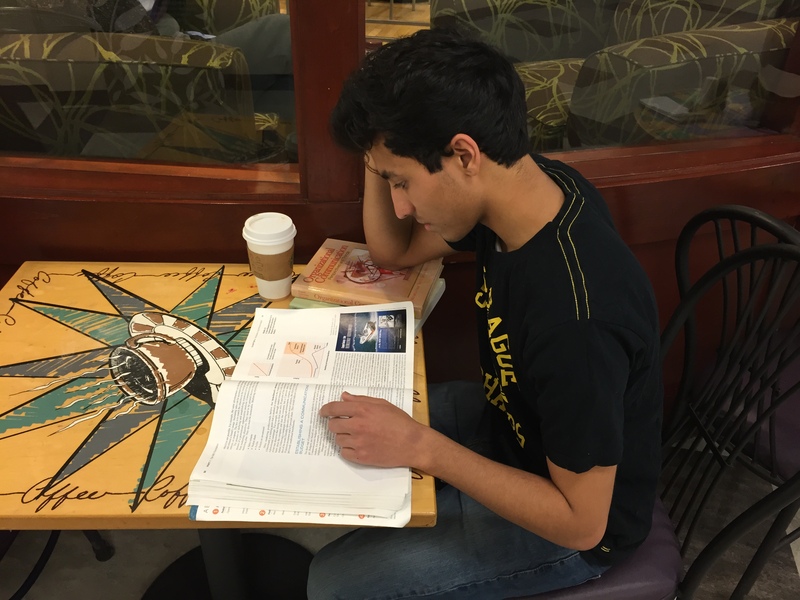 Craig Miranda, a first-year computer science major, is in the midst of his first finals week. To help prepare himself, he’s been studying heavily, even if it means pulling an all-nighter. For some, it takes days, even weeks, before culture shock sets in. For Craig Miranda, it took seconds. The Kuwait native, who is half Indian and half British, arrived in the United States this past summer for the first time. Disparities were everywhere. Green grass. Trees. Leaves. Blonde hair. Couples holding hands. Nothing was similar to what Miranda was accustomed to in Kuwait, which had been his home for all 18 years of his life. “It’s a big culture shock coming from Kuwait, which is closed off from the rest of the world, to America, which is wide open,” Miranda says. Miranda noticed these differences when he and his family vacationed in California in July and again when he arrived at Penn State Behrend in August. But for Miranda, the culture shock wasn’t all bad. Miranda, a first-year Computer Science major, says leaving his family was difficult. Miranda has found plenty of distractions to ease the transition. He’s quickly made friends and has enjoyed his coursework. He has been working on his tennis game, and plans to try out for Behrend’s team this spring. Miranda regularly calls his parents, Colin and Sandra, and he plans to visit his brother, Clive, during the winter break. Clive is pursuing a master’s degree at Georgetown University in Washington, D.C.
“I thought it would be difficult, but the people here have made the transition so easy,” he says. Miranda has also been proactive in making the most of his new environment. He’s taking advantage of the opportunities that Penn State Behrend provides and is already leaving his mark on the campus community. Miranda, a self-described Adam Levine fanatic who likes to sing and play the bass guitar, has an affinity for pop music, and he wants to find a way to experience that music alongside fellow students. He’s currently in the process of getting approval for a new club that would accomplish just that. Miranda is in the process of getting approval for the new club, and he’s looking forward to performing alongside fellow students. That’s not the only thing he’s looking forward to though. In Kuwait, summer temperatures can exceed 120 degrees. Even in winter, average daytime temperatures rarely fall below 60 degrees. Considering the fact that Erie had 138.4 inches of snow last year and earned the honor of America’s snowiest city, it probably won’t be long until Miranda is up to his ankles (okay, shins) in the white stuff.